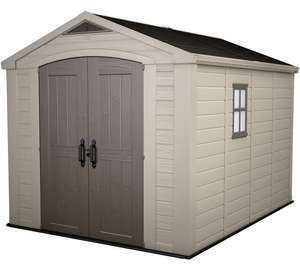 Manufactured in durable resin with steel reinforcement, the Keter Apex 8x11 Shed is built to last. Complete with wide double doors, the 8x11 features a window and skylight for additional daylight access. It also includes two shelves and brackets, and heavy duty floor. Low maintenance and virtually fade-free. Just an occasional wash is all that is needed to keep it looking new. External Dimensions: W: 256.5cm D:331.5cm H:243cm. For a clearance item I would expect a better discount? It is a great price but they don't seem to be able to deliver to any postcodes I have put in, I bought one of these from Costco just before Christmas as they had the best price on it. Its out of stock everywhere I looked. Same here, I checked this last week and there was no stock anywhere . Save £57.00 (Was £719.99)For a clearance item I would expect a better d …Save £57.00 (Was £719.99)For a clearance item I would expect a better discount? Thanks for the feedback, I was looking into getting the slightly smaller version. But the reviews are either very good or very bad. Rubbish price, I had similar one (same size) from amazon for £350 a couple of years ago) I then got a further over £100 refund due to some minor scratches.....that was a bargain! Rubbish price, I had similar one (same size) from amazon for £350 a couple …Rubbish price, I had similar one (same size) from amazon for £350 a couple of years ago) I then got a further over £100 refund due to some minor scratches.....that was a bargain! I have one of these, been superb for me. Got it from Costco.